Neosho, Mo.—One of the world's most reliable rockets, an engine without a name, is produced in undisclosed numbers at a plant employing 1,100 persons outside a tiny community in southwest Missouri. Click image for a 1380x1998 pixel version of this image in a new window. STEAM CLEANING of chamber is necessary to meet rigorous cleanliness requirements of Atlas engines. Workman tightens connection to chamber manifold. 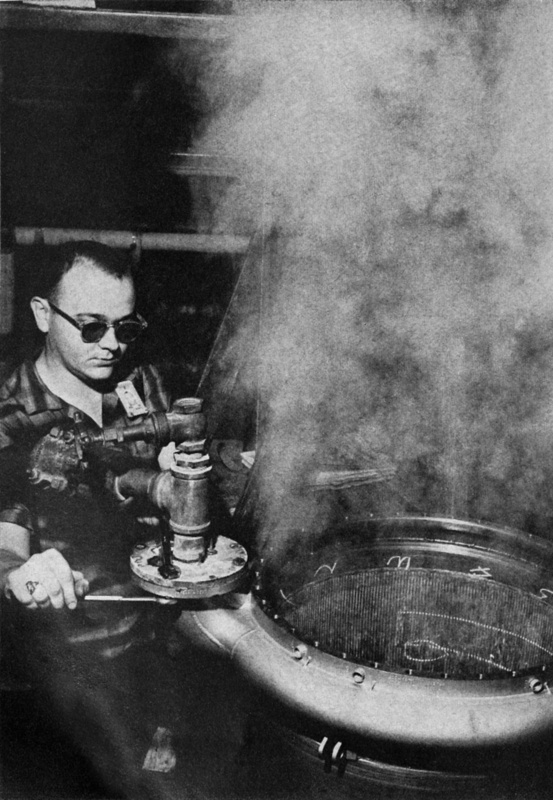 Rocketdyne Division of North American Aviation produces the liquid-propellant rocket that serves as powerplant for the Jupiter and Thor and as booster for the Atlas at a government-owned installation on the grounds of Ft. Crowder, a now inactive Army camp. Military code designations are all the LOX-kerosene engine has for a name. As Atlas booster, the latest version is called XLR-89-NA-5. As engine for the Army Jupiter, it is the S-3D. Whatever the designation, it was rated originally at 150,000 lbs. thrust, with tanks for burning 160 sec. in the basic Thor. Recently, the engine has been upgraded to 165,000 lbs. to improve the Thor and give Atlas a longer range. A further modification, designated H-1, has been souped up to 188,000 lbs. thrust for clustering into the Saturn booster. Rocketdyne performs research and development work on this and other engines at Canoga Park, Calif. When they go into production, activity shifts to Neosho. 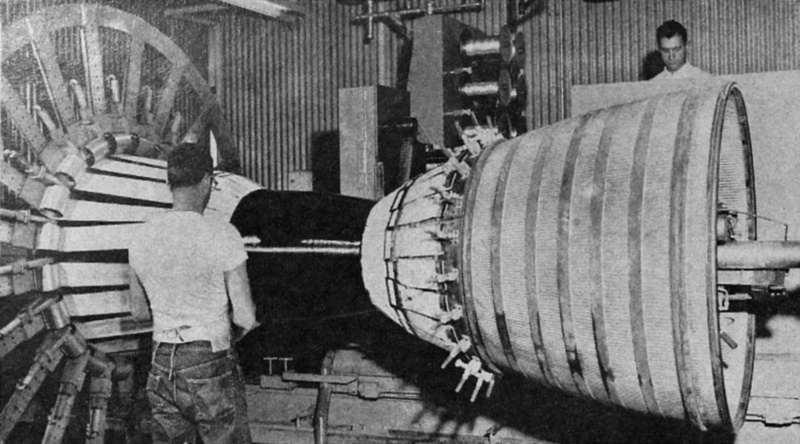 However, the 57,000-lb-thrust, four-minute-burning Atlas sustainer is produced at Canoga Park. Earnest A. Wright is manager of the Neosho plant, which has about 250,000 sq. ft. of floor area, a two-stand engine test area and a separate area for testing pumps, generators and vernier engines. Wright says the improvements developed in the engine recently have been introduced to production models, both of Atlas booster and Thor powerplants. The improved Thor engine, which Rocketdyne designates "Block 2," will be used for space experiments. Further improvements have been made in the Atlas booster. Rocketdyne calls the latest version MA-3. • Ameliorations—Wright said the Thor improvements include simplified valving, substitution of a pyrophoric igniter for a pyrotechnic igniter and the increase of pump capacity to increase thrust. He explained that the new igniter uses tri-ethyl aluminum in the fuel line with a cartridge on either side. When the pumps start, fuel pressure breaks one cartridge, and the igniter fuel flames up on contact with air. Regular fuel following behind the second cartridge is ignited by the triethyl flame. Meanwhile, LOX feed begins a few milliseconds later, at which time thrust has reached 90%. The Atlas MA-3 saves weight by using fiber glass wrapping instead of steel bands to reinforce the thrust chamber and reduces the number of components further. This is partly achieved as a result of a new control system that uses fuel from the missile itself to operate the engine sequences, instead of pneumatic and hydraulic sequences as in earlier models. Click image for a 1379x765 pixel version of this image in a new window. FIBER GLASS WRAPPING applied to the thrust chamber of Atlas MA-3 engines replaces heavy steel bands, reducing weight but keeping same strength as steel. •Many suppliers—Production at Neosho begins in the receiving department. Rocketdyne bought $9,953,394 worth of parts, components and raw materials last year from slightly more than 1,500 suppliers. More than one-third of the purchases were within an immediate four-state area (Missouri, Kansas, Oklahoma and Arkansas) within 150 miles radius. Of all purchases, 40.8% were from companies with fewer than 500 employees. Much of the work given to subcontractors is on small metal parts, particularly when the plant machine shop is overloaded. Rocketdyne says many small machine shops in the area do extremely high quality work. One example is Sibley Engineering & Manufacturing, a 19-employee firm in Sulphur Springs, Ark., whose chief product is a gizzard skinner used widely in the poultry industry. The owner, Milton Emanuel, is a former employee of a meat-packing company. Another subcontractor, Claude Roderick of Monett, Mo., proprietor of Roderick Arms Tool Co., is in the rifle business, but does machine-shop, tool and die work for Rocketdyne. A typical day's incoming shipments at Rocketdyne include a lubricating pump from Pesco Products, forgings from Harvey Aluminum and American Brake Shoe, a valve assembly and an oxidizer check valve from Valley Bolt Corp., valves from H. W. Loud Machine Works, flex hose from Titeflex Inc., lubrication tank from Weldfab Inc. and servovalve and actuator from Moog Valve Co. Between 800 and 1,000 different parts are manufactured in the Neosho plant machine shop, headed by General Foreman H. A. Eathorne. Many kinds of metal are machined. •New alloy—One of the newest is an aluminum alloy developed by North American, called Tens 50. Castings of the new alloy are machined into the unusual shapes needed for the volutes in turbopumps. Tens 50 is harder and has greater strength than the aluminum alloy formerly used. This is a major factor in the uprating of pump capacity, which made it possible to increase thrust. Another such change was a switch to Tens 50 from another grade of aluminum in the turbopump gear case. Also, the number of parts was reduced by switching from two pieces to one. Hundreds of operations are involved in machining the complex gear case. The job takes weeks to complete. Work is programmed so that different phases go on simultaneously. "Tape-controlled machines come into their own on jobs like this," Eathorne says. "We get precision and repeatability. And we save on personnel costs." Click image for a 1378x984 pixel version of this image in a new window. AUTOMATIC INDEXING machine used to drill holes in injectors, assures proper alignment, accurate angle. Tape control makes products identical. In other changes in uprating the pumps, the inducer material went from plate 2024 aluminum to die-forged 2014 aluminum, and the impeller went to Tens 50 from another grade of aluminum. The inducer, which looks like a four-bladed outboard motor propeller, spins to maintain the flow of liquid into the pump. The impeller, inside the pump, does the main job. Alcoa supplies the aluminum forgings. Other major parts machined in the Rocketdyne shop include a die-forged aluminum thrust chamber dome, the main injector of hand-forged 4130 steel, with its 3,000 holes, and aluminum and stainless steel special fittings and crosses. D. B. Gore, chief of engineering, says the Tens 50 alloy patented by North American was originally called T42. Variations of Tens 50 have 0.2% offset yield strength averaging 35,000 psi. Ultimate tensile strength averages 43,000 psi. Tens 50 is the same as aluminum alloy 356-T6 except that it has 1% higher silicon content and a little beryllium. The composition is aluminum plus 7.6-8.6% silicon, 0.4-0.6% magnesium, 0.1-0.3% beryllium, 0.1-0.2% titanium and traces of several other elements. The largest component of the engine, the thrust chamber, is produced in the metal fitting, welding and processing department, headed by General Foreman Frank Holkenbrink. This department also does all sheet metal work. Assembly of the thrust chamber starts with 292 formed cooling tubes of pure nickel, chosen because it is very ductile and a good heat conductor. The tubes are stacked on a torch-weld jig and brazed together with silver solder. Silver was selected for its extremely high heat conductivity and relatively high strength. In brazing, production workers start at the narrow throat and work both forward and backward, so that the combustion chamber and exit cone are reached simultaneously. To reinforce the tail cone, 4130 steel bands are used. In the older design, 3/16 in. bands reinforce the combustion chamber and 11 bands 1/16 in. reinforce the tail cone. In the newer design, glass wrapping replaces all steel bands in the chamber area. Seal tube ends. At rear connect adjacent pairs. At front end, mill slot in every other tube and seal its end. Leave other tube open for feed to injector. Attach thrust ring to front end and machine it. Attach bands and ring to manifold. Pressure test to 1,000 psi prior to glass wrapping. Insert expandable mandrel inside chamber. Paint seal coating on chamber to give good surface. Attach fiber glass strips, soaked in epoxy resin, lengthwise at 18° intervals. Rotate 9° and attach another 20 lengthwise strips spaced between first set. Wind another layer of fiber glass. Cut off ends of strips. Attach fittings and wrap on with fiber glass. Clean, paint and deliver to assembly. 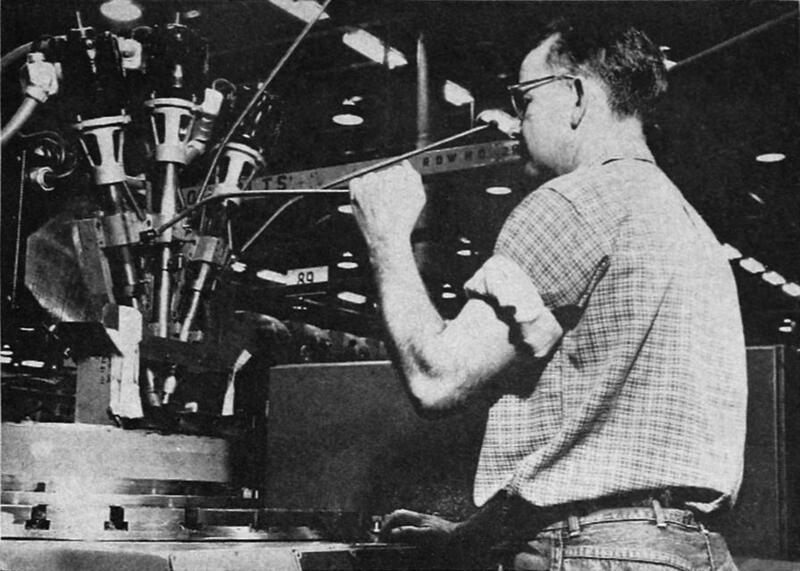 In the assembly area, headed by General Foreman C. W. Bright, the first step is trimming impellers for the required power curve. Since thrust was uprated, the trim must be different from that in earlier models. Mate impeller to gear case. Pressure-check and cold-check LOX line with liquid nitrogen. Hot-fire turbopump at test area. Leak-test and visually inspect pump on return. Test thrust chamber in water flow and calibrated for pressure drop. Build up gas generator and test in hot-test area. Mount turbopump, injector and gas generator onto thrust frame. Link components with hoses and lines. Test sequencing and for leaks. Hot-fire engine in test area. Make second electromechanical checkout at shop; optically verify that geometric center of thrust chamber is within prescribed tolerances. Inspect torque valves for leaks; verify complete procedures. A similar but less involved procedure is used in manufacturing vernier engines, the only other major item produced at Neosho. The vernier develops 1,000 lbs. thrust that gives the Atlas and Thor their final velocity. Two engines are used on each missile; the Jupiter has none. The vernier weighs between 75 and 80 lbs. The main difference between Thor and Atlas verniers is in the way the vernier is attached to the missile. In earlier models, designated Block 1, the vernier was ignited pyrotechnically. The Block 2 vernier uses a pyrophoric mixture of tri-ethyl aluminum and tri-ethyl boron. The contents of this page, in their entirety, were reproduced from the August 1, 1960 issue of Missiles and Rockets , available on archive.org. Since these magazines are freely available on archive.org, I assume that the copyright has been transferred to the public domain.